Chase Utley hits a solo home run in the first inning against the Chicago Cubs (Andrew A. Nelles/AP). Cliff Lee certainly rebounded from his poor Opening Day Start. The left-hander threw seven shutout innings, leading the Philadelphia Phillies to a 2-0 victory over the Chicago Cubs. Lee came off one of the worst starts of his career when he surrendered eight runs in five innings against the Texas Rangers. Five days later, that start can be forgotten. Lee did allow ten hits, but escaped any potential jam as the Cubs were 0-for-7 with runners in scoring position. Lee struck out six and did not walk a batter. Chase Utley quickly put the Phillies on the board with a solo home run in the first inning. Cubs’ starter Jeff Samardzija made the mistake of throwing a fastball down the middle, and Utley took advantage. He crushed the ball through the wind and into the right field bleachers. Utley later scored in the fourth inninng off Domonic Brown’s RBI single that put the Phillies up 2-0. Utley also added his 300th career double in the eighth inning. 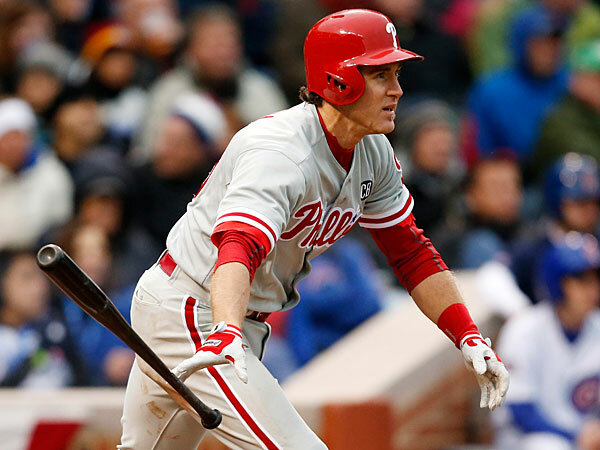 Utley has started the 2014 season on the right foot, going 7-for-18 in this first week of the season. Similar to Lee, Jonathan Papelbon needed a chance to rebound. Papelbon has been the recipient of criticism after he blew a save against the Texas Rangers. He avoided additional criticism with Saturday’s 1-2-3 save. He struck out one in the process of securing the 2-0 win. The Phillies didn’t require a whole lot of offense today with Lee’s performance. Utley provided the blast, and that was all the Phillies needed. The Phillies will go for their first sweep of the 2014 season, as A.J. Burnett will make the start tomorrow against the Cubs.